Doug Ross @ Journal: OBAMA'S PARTNERS IN PEACE: We Have 100,000 Missiles in Lebanon; "Opportunity to Detroy Israel is Now Better Than Ever"
OBAMA'S PARTNERS IN PEACE: We Have 100,000 Missiles in Lebanon; "Opportunity to Detroy Israel is Now Better Than Ever"
It is now clear to even the most obtuse observers that Barack Obama misled the American people, treated the feckless Republican Congressional leaders like the fools they are, and basically behaved like a Bond villain in ensuring that the Iranian terror state could secure nuclear weapons. Iran's leaders continue to celebrate the deal, most recently issuing public statements during an iftar meal to break the Ramadan fast. 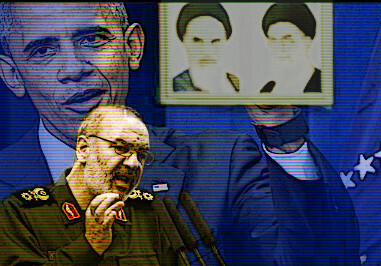 Each of Iran's leaders took turns calling for the destruction of the United States, Israel, and the West. ...“Today, the grounds for the annihilation and collapse of the Zionist regime are [present] more than ever,” he declared, saying there are “tens of thousands of destructive long-range missiles” from Islamic territories aiming at all of “occupied” Israel... "[and] the opportunity to destroy Israel is now better than ever." When war breaks out between Iran and its neighbors -- and it will -- you can thank Barack Obama and Hillary Clinton. Their legacy will be apocalypse and their names will be synonymous with death and calamity. Time and time again we see the Obama Doctrine, and that is to lead from behind, create chaos, act passively while being pleasured, and allow the enemies of America to set her policy. when can we run him up a fags pole? Why would you want to polarize the facts?